This node creates a terrain from an 3D mesh file. The mesh is transformed into a heightmap by computing a depth projection according to a viewing vector. A simple analogy would be to imagine that we scan the mesh with a moving laser and use the measured distance between the capture plane and the mesh as the value of the heightmap. The laser position and direction can be decided between six fixed projection directions (i.e. Â± X, Â± Y, Â± Z axis). Both the grid size and the cell size are given by the user. 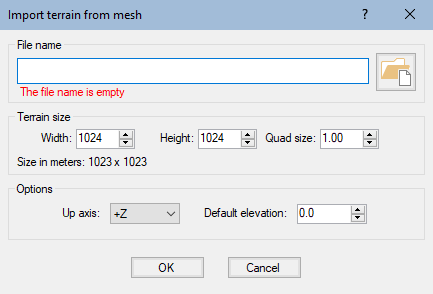 Note that as the width, height and cell size parameters specify what rectangular area we want to capture and since the mesh is defined in world space, only empty space could be captured. To add a node, right click in the Graph Editor and select Create Node > Import > Import from mesh. File name: Click on the folder button and browse to the file you want to import, or type the directory of the file to import. File names with Unicode characters are supported. Terrain size: Displays the Width, Height, and Quad size of the terrain. 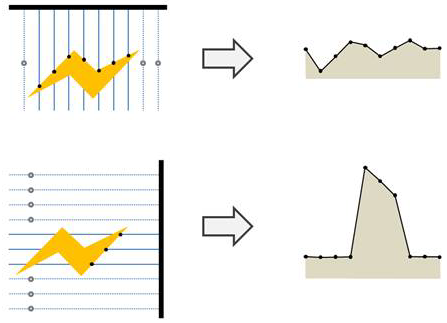 Up axis: Sets which axis to use to measure the elevation. Default elevation: Sets a default height of points on the grid that do not project onto the mesh.